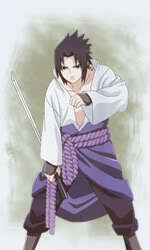 Den looked toward the shinobi as he left, surprised to find that he was an Uchiha like Den. Ever since I found out I was an Uchiha i have been meeting them everywhere. Den thought, wondering why this Herou guy didn't have his Sharingan activated, or if he had just deactivated it and Den had never noticed it. He might not have his Sharingan yet, I didn't get mine until recently. Den thought, though he wondered why he wouldn't have the Sharingan yet, Maybe that's why he and this guy were fighting, so he could get it. Den thought. Den was surprised that this guy knew his name, and that he was respected. Also it seemed that the shinobi did know nami, the girl that was joining the Sound Four, or Two, depending on where Jakusha assigned her. den bowed down to the Leaf shinobi before he spoke, sfraid that he might insult him if he didn't, and wanting to show he was respectful. Yeah, that's me, though I prefer to be called Den. So what is your name? Hero began to walk into his house watching his to new first friends chat. "I'll see you guys later and Den stop by from time to time okay. I get bored and i'll do anything to do something intresting around here. There have been some rumors about stuff going on here but im not involved. I wish I was. See you guys later." Hero said walking into his house with a smirk.